The late Kiwi motor racing star JasonRichards was honoured when his family unveiled the trophy in his name at theITM 400 Auckland in Pukekohe today. The Jason Richards Memorial Trophy will beawarded to the driver with the best combined results over the four V8 SupercarsChampionship races at Pukekohe Park Raceway this weekend. Wife Charlotte, daughters Sienna and Oliviaand Jason’s parents were at the unveiling, staged fittingly in the garage ofhis team, Brad Jones Racing, and flanked by team members and fellow New Zealanddrivers Fabian Coulthard and Greg Murphy. The trophy by well-known artist FrankWatson of Ardmore is a two-sided glass sculpture with black onyx centrepieceand stainless steel arches depicting the fern, set into a native timber baseand silver. “I like it and I think Jason would like itwith the chrome and the fern. I love the fact it has Jason’s logo on there andI think it will be a spectacular moment on Sunday evening when someone gets tohold this trophy,” said wife Charlotte. She said that unveiling the trophy had beenboth a good and a difficult moment. 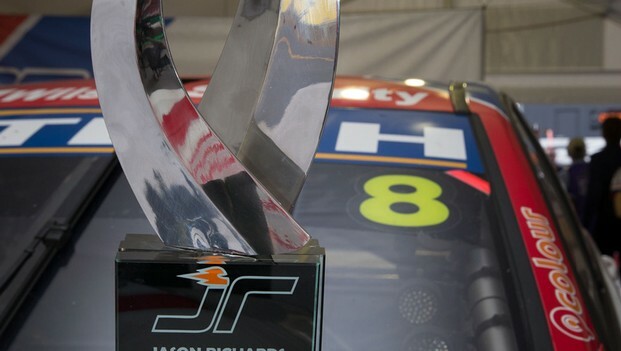 Organisers received support from the familyfor the trophy to remember Richards, the Nelson-born V8 Supercars driver, whopassed away from cancer 16 months ago. After a successful apprenticeship in NewZealand, Richards was signed to the V8 Supercar Championship for 11 years from2001, driving for Team Kiwi Racing, Team Dynamik, Tasman Motorsport and finallyBrad Jones Racing. He won once in the V8 Supercar Championship and was athree-time podium finisher at the Bathurst 1000. Tomorrow is the start for the quest for thetrophy with qualifying and two 100km races, which is repeated on Sunday. Tickets are on salefrom Ticketek with three-day general admission for NZ$110 and new improvedthree-day grandstand tickets from NZ$145. Kids 12 and under receive free GAentry into the event with a paying adult.